Nothing screams home makeover like the words do it yourself (better known as DIY)! You can turn on any home network on the television and find DIY shows that teach homeowners like us to create masterpieces through their home makeovers. One of the many ways people use the DIY method in their home makeovers is the installation of a backsplash. These backsplashes may be in the kitchen area or in the bathrooms. Either way, backsplashes can certainly take a room and transform it almost instantly. 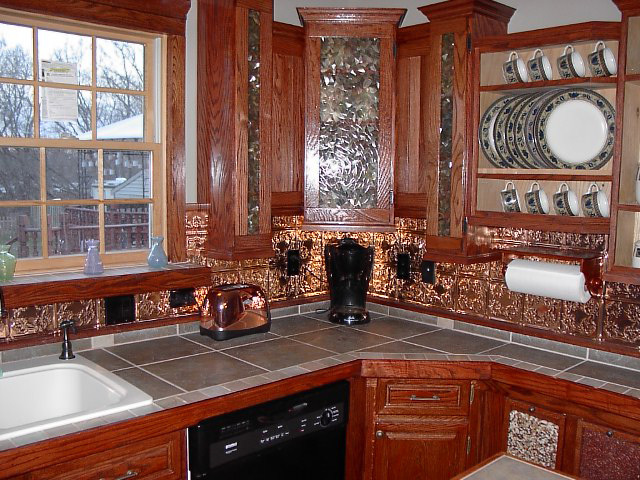 When looking to makeover your kitchen backsplash, you should strongly consider metal backsplash designs! Why a metal backsplash? Simply because when you’re working in your kitchen (cooking, cleaning, etc. ), you will inevitably make a mess. Whether the mess comes from grease spraying the backsplash from the pan or you getting flour on the backsplash from your stand mixer, the backsplash must be metal in order to withstand the rough conditions. Some metal backsplash materials that are great for the kitchen are aluminum, copper, and tin. Using these metals as backsplashes are ideal and the most common you will find for purchase. 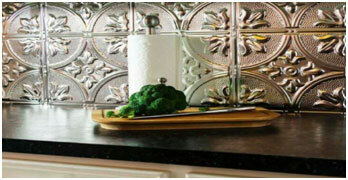 In order to create a metal backsplash for your home, you don’t need to spend a fortune on an installer. In fact, you can easily install a metal backsplash yourself for half of the cost. Let’s take a look at some of the DIY metal backsplash ideas you can do in your home. Metal roofing tiles are great for making your metal backsplash stylish and economical. You can find these metal roofing tiles at stores or, for even more affordable options, you can purchase them online through tile manufacturers. These make great DIY metal backsplash options because they can be installed right over whatever existing backsplash you have and require no mess! All you need is some heavy-duty glue and a little bit of time! 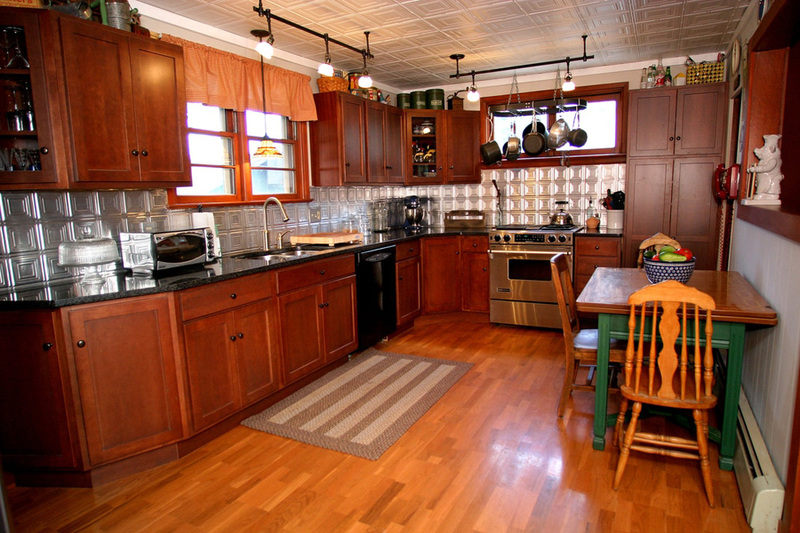 Metal tin tiles are great for creating a beautiful metal backsplash in any kitchen. What makes them great for DIY purposes is they require no grout. The tin tiles come in squares and can easily be cut to fit the specific sizes you need. 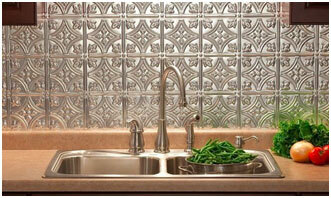 You will find these metal backsplash tin tiles in rustic kitchens all the way to modern kitchens. They really are super versatile and great for giving you the style and design you want with the ease of DIY installation. If the industrial kitchens at the restaurant strike your fancy, you can bring that look into your own kitchen easily and affordable. A steel backsplash is great behind a stove range because it’s fireproof, easy to clean, and stylish. 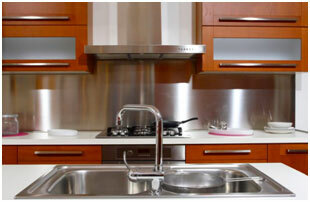 You can either get these stainless steel backsplash sheets in flat or pressed designs. To install, all you need is heavy-duty adhesive glue and metal cutters to give you the look and feel you desire from a metal backsplash. If you are new to the DIY game, it’s quite possible that there are some tips and tricks you’ll need to know before heading off to install your own metal backsplash. Because DIY can save you so much money in the long run, it’s important to know some of the tips to avoid overspending due to mistakes and oversights. Every kitchen backsplash is different. There are no two backsplash areas that are the same and some will require more cutting than others. To keep the cutting to a minimum (because cutting metal isn’t like cutting paper or vinyl), you will want to measure the area first. A DIY hack tip: use those measurements to mark off an area on the floor first. Then, put your tile down on the marked off floor area to find out what you need to cut before starting to work on the actual backsplash area. This will save you tons of headaches and time. In order to keep the cuts as least noticeable as possible, cut on the tops and sides of the marked off area. Always make sure that your backsplash area is dry before you begin installing. Even though metal backsplash materials like tin tiles or stainless-steel boards don’t require grout, you will still need a dry surface for the adhesive to stick to thoroughly. There is nothing more frustrating than trying to cut metal when you don’t know how to do it efficiently. You will want a blade that is actually meant for cutting metal. You can use a carbide blade or even a diamond blade that is made specifically the type of metal you are cutting. This will ensure that you are safely cutting metal and not wasting time. You can use a hacksaw or even a band saw with the right blade for major efficiency. Manufacturers will recommend what is best for cutting their specific metal type. If you are unsure, consult a hardware store before cutting. Metal tiles should be cut face up while using protective eye protection. Be careful to watch your blade carefully as cutting metal with metal can cause the blade to heat up and even smoke. If this is the case, you want to use a cooling oil on the blade to keep from sparking a fire or burning yourself! As a rule of thumb, be sure to sweep up the area in which you are cutting metal in order to avoid leaving sharp shards that can be dangerous to barefeet! Most of the metal manufacturers will advise you on the type of adhesive to use. For general use, you will find most manufacturers recommend silicone or urethane-based adhesives. All you need to do is squeeze the adhesive onto the back of the metal and press them firmly on the wall where you want it to go. Always follow directions per the manufacturer of both the metal and adhesive for the best use. As you can see, installing a metal backsplash DIY style can be easy and affordable. Shop around for the most cost-effective metal materials to keep your budget down and the style up!